Smarter Starter? Soup or Salad? 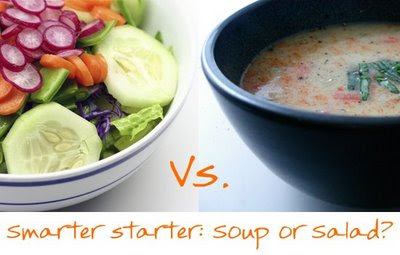 Soup or Salad for your starter? Liquid hydrates, calms hunger. Thirst=false hunger. Warm temperature stimulates efficient digestion, blood to stomach. Healthy soups can be low in calories and fat, high in veggies. Slows down drinking of caloric beverages or alcohol. Easy to digest, less chance of stomach upset. Not possible to modify. Can't request a healthier version or to detract ingredients like cream, butter or heavy oils. Hot soup can be low in live enzymes. Possibly low in fiber, unless high veggie content. More difficult to judge ingredients/health factor from menu description. Easy to modify/customize, dressing/cheese on side. Raw live salads contain live raw enzymes. Will spur digestion naturally without taxing digestive system. Less need for body-provided enzymes. High in nutrient dense veggies. Requires lots of chewing which can signal your stomach that the meal has begun. Sometimes prepared with low nutrient dense leaves. If unmodified, may contain high calorie dressings, cheeses or toppings. If low quality veggies, harder to digest, risk of stomach upset. Cold salads don't warm stomach or inspire blood circulation to enhance digestion. Mental handicap: "I just ate a salad, I can go crazy on my entree." Read more for my answer to this question: Soup or Salad? Gosh it's quite a toss up isn't it. I know you want me to say a definitive answer, a black and white decision that you can forever live by when starting a meal. But food or life isn't that simple. I say start with the salad. ...BUT do include a soup course if you can! 1. A raw salad will contain many live enzymes that aide in digestion. Raw foods at the start of a meal contain enzymes, thus your body will not need to tax itself by working hard to use and signal for body-made enzymes. Great rule: start your eating and chewing by chewing raw live foods. Even if the next course is cooked and hot, those first course enzymes will still be present to aide digestion for the entire meal. 2. Chewing. You have to chew a lot to eat a raw salad. And chewing is the first task for healthy digestion. It stimulates saliva and tells your body that a meal is on its way to the stomach. 3. Fiber. Salad will most likely contain more fiber. Thus making you feel fuller faster. Soup is indeed a great starter, but I still like my "raw first" rule. And the fiber factor is huge. Also, the lack of chewing during a soup first-course is not the best for digestion. And too many times I see soups on the menu that contain cream, butter, cheese or other heavy ingredients that you cannot modify. The chance of an unhealthy soup course is higher than an unhealthy salad course. And lastly, the high sodium content of many soups can lead some to feel hungry, and it can also effect sensitive folks blood pressure. And like I said, use your common sense. Don't go choosing a Caesar Salad over a low-fat Veggie Miso soup. Or a Iceberg lettuce, ranch dressing, feta cheese salad over a clear broth noodle soup or low-fat butternut squash. ...your can't simply say, Kathy said salad! Gotta get the Deluxe Blue Cheese Chop Salad! Most healthy choices are common sense. But the "raw food first" rule is a great one to remember. What do you think? Soup or Salad?